You want to text all your friends and love ones without worrying what network they are using? With Talk N Text, you can register for their latest unlimited text to all networks promo for only 30 pesos valid up 3 days. 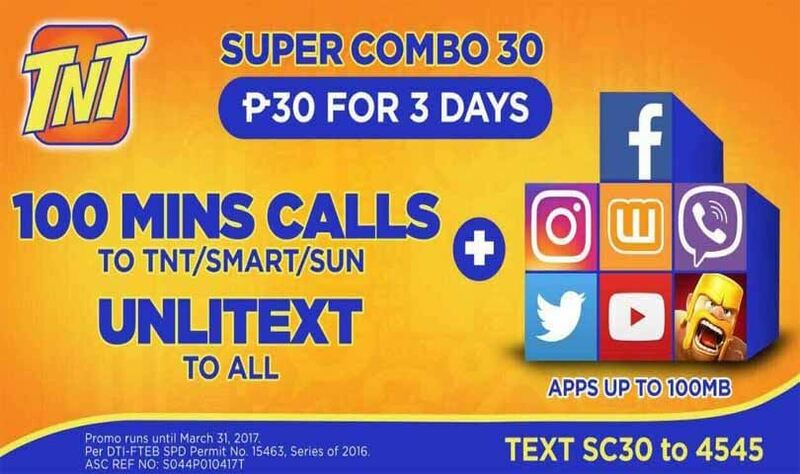 The new TNT Super Combo SC30 promo for 2017 also gives you minutes of call that you can use to contact subscribers from Smart and Sun Cellular. Another plus with this combo is that you can use social media apps like Facebook, Twitter, Viber and even play mobile games like Clash of Clans. To subscribe you can use the keyword for this super combo promo then send to TNT access number. Make sure you have enough regular load balance on your account before you register. You can also ask your retailer if it’s available on their load menu to directly reload it your mobile number. If your prefer SMS, check out below. What makes it more valueable for prepaid subscribers is the added TNT Extend Promo, where you can enjoy SC30 for another more days at a very friendly price on the same services offered. If you want 5-days unlitext to all networks try UAT30. You can watch for the latest TV commercial airing soon on your favorite channels.